The warranty is for a period of one year. Brannon painting warrants against peeling and blistering due to defective workmanship. This warranty is non transferable. If these conditions are met, Brannon painting will perform repairs with no labor charge. 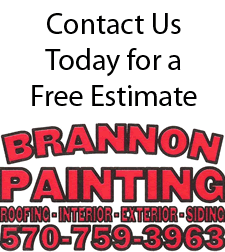 Brannon painting will perform repairs only for the original customer. Brannon painting will repair only areas where peeling and blistering has occurred. Brannon painting will not exceed repairs mentioned on original estimate sheet.